Costa Fisch sunglasses and prescription sunglasses feature no-slip Hydrolite lining and the Costa signature three-hole venting system on the front to keep things cool even when you turn up the heat. The Costa Fisch frames incorporate an integral hinge system with a heavy-duty TR 90 nylon frame for max durability. Rx-needs? No problem. 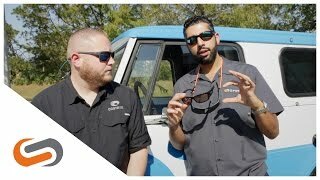 The Costa Fisch sunglasses are prescription ready and our expert opticians will gladly custom-build your very own pair of Costa Fisch prescription sunglasses.